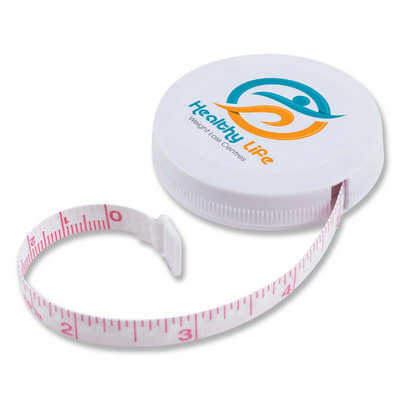 1.5m polyester tape measure with push button retract action. Tape - Metric calibrations on one side and imperial calibrations other side. White tape with red calibrations and red push button to retract. Colours - White Size - 50mm Diameter Decoration Area(s) - Pad Print : Front - Circle 36mm Diameter; 4CP Digital Direct Print : Front - Circle 38mm Diameter. Price includes : 1 Col 1 Pos Print. Setup is included.